I know at first this seems a bit harsh and maybe a bit rude, but it's not mean't that way at all. I drew this for my sister because this has become our catchphrase or joke really. I have to admit that people aren't impressed when they hear us say it to each other. We almost say it all the time as a joke because the way it came about was funny. Years ago my sister and I were visiting family, and to my sisters annoyance we had to share a bed. I'm not easiest person to share a bed with; apparently I kick, punch, etc. Nice. Anyway at the time I was reading Agatha Christie 'Murder on the Orient Express' (a great book) and one night a chapter ended with a line from Poirot, "I do not like your face". The most amazing line I've ever read and an equally amazing way to end a chapter. With that I turned to her and repeated this line, shut my book and went to sleep. She was obviously shocked and upset, but mostly confused and being a mean sister I didn't say anything more. In the morning the first thing she said to me was "You kept hitting me in the face last night", to which I replied "I told you I don't like your face". Haha. Best moment ever. 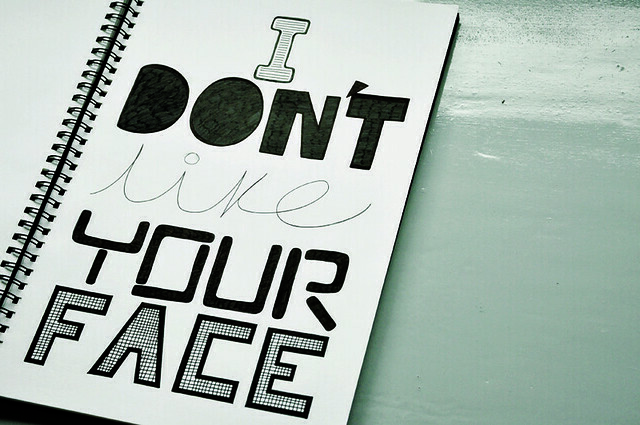 So 'I don't like your face' has become our catchphrase to that moment, but mostly it's an ode to the best line of speech we've ever read. Poirot you crack me up.